It’s no secret that we like to have fun at Net Atlantic. And we happen to have a lot of great cooks on our staff. So, last year we decided to start an annual Crock Pot Challenge. This year’s event, held last Friday, did not disappoint! 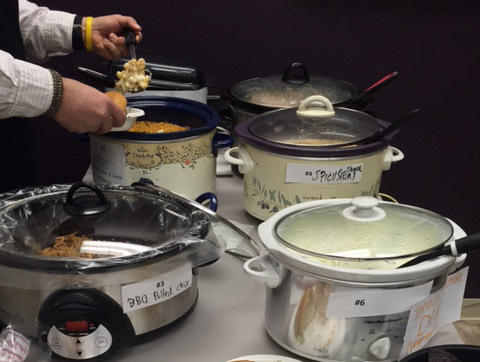 Participating staff members were asked to bring in their best Crock Pot recipes, and everyone in the office was invited to sample each one and vote for their favorite. Entries included delicious delicacies like Buffalo Cauliflower, Swedish Meatballs, Ultimate Macaroni and Cheese, Spicy Shrimp Chowder, BBQ Pulled Chicken, and Spinach and Artichoke Dip. The dishes were kept anonymous, so nobody knew who cooked which one. Trying to guess who brought what only added to the fun. Our winner was our newest employee, Lee Richardson, who was responsible for the Spicy Shrimp Chowder. Lee won a Visa gift card, and a very fancy wooden spoon to commemorate the event, which he has proudly displayed in his cube. What kinds of fun staff events does you organization put together? Tell us in the comments!